Several Sundays ago, I happened to breakfast at Denny’s. I’m thinking “OH MY GOD! What am I going to get here? 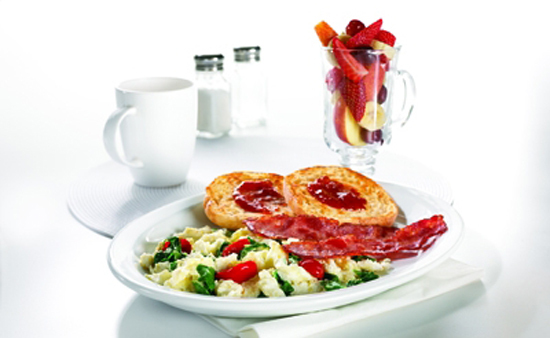 Is there anything healthy?” I was surprised to see their Fit Fare menu options which are meals under 550 calories. 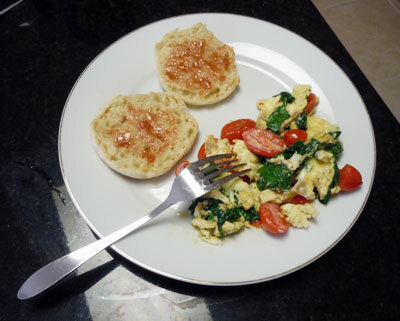 I chose the FitSlam – 3 scramble egg whites, spinach, grape tomatoes, turkey bacon, with an English Muffin and a side of fruit. It was priced at $6.99 and I was stuffed. I didn’t even finish my fruit because I was so full. Heat frying pan on High with 2 tbsp of Olive Oil. When hot lower to Medium. Beat eggs with fork until consistent. Add Baby Spinach and Cherry Tomatoes to frying pan for 30 seconds. Add beat eggs to veggies, scrambling eggs at the same time, until eggs are cooked to your preference. I didn’t have any bacon, so I just had a veggie style Fit Slam. I was pretty full. 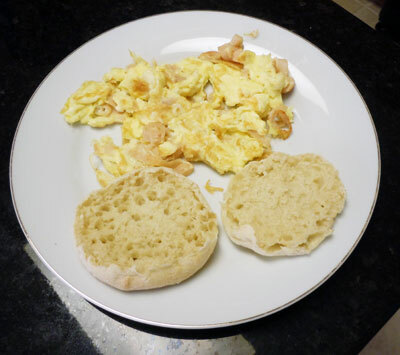 I ate only half of my English Muffin and cleaned off the scramble eggs and veggies. I would eat this again. It was very quick to make and delicious. My husband does not like veggies so I swapped it out for deli sliced turkey. I used scissors to cut up turkey, added it to the frying pan with hot olive oil, just to cook it a bit. When it get kinda browning, I add the eggs and scrambled. He also had 1 English Muffin. No complaints from him so must have been okay for him. This is a quick Rachael Ray recipe. I love it! It’s so easy to make and it’s so good. 1. Position a rack in the upper third of the oven and preheat to 400°. On a rimmed baking sheet, toss the chicken with 1 tablespoon olive oil, the thyme and 1/2 teaspoon each salt and pepper; roast for 20 minutes. 2. Meanwhile, in a medium bowl, combine the mushrooms, onion, peas and the remaining 1 tablespoon olive oil; season with salt and pepper. Add the vegetables to the chicken and cook for 25 minutes more.